Antioxidants are naturally occurring compounds that protect the body from the damaging effects of highly unstable molecules called free radicals. Free radicals are also naturally occurring, and they are by-products produced by your body during digestion or from exposure to the sun’s UV rays, tobacco smoke, air pollutants and other environmental insults. In small amounts, free radicals are actually beneficial to human health. However, excess free radical production combined with a deficiency in antioxidants can eventually lead to cell damage. And over time, this cellular damage, known as oxidative stress, may contribute to poor heart health. Making matters more complicated, there are several types of antioxidants and most have multiple roles in the human body, some of which have yet to be elucidated. In addition to scavenging free radicals, certain antioxidants work as anti-inflammatory agents, cell signaling agents or impact gene expression. Some antioxidants also up-regulate immune system functioning directly or indirectly by preventing free radical induced damage to immune cells. Vitamins C, E and A are among the most well studied antioxidants. Vitamins C’s Role: Vitamin C protects molecules from free radical damage and also helps regenerate vitamin E. Diets that contain plenty of vitamin-C-rich foods protect against cellular damage. Research shows vitamin C in combination with beta-carotene and zinc oxide can help promote the health of your eyes, an especially important health consideration as you age and worry about age-related vision loss. Vitamins E’s Role: Vitamin E is found in cell membranes where it acts like a shield of armor protecting against oxidative damage that disrupts membrane structure and functioning. There are eight forms of vitamin E.
Vitamins A’s Role: Dozens of carotenoids, dark-colored pigments found in fruits and vegetables, are found in plant foods. They are responsible for the brilliant orange hue in carrots and sunshine-yellow color of corn. A common examples of a carotenoid includes beta-carotene, which is converted to vitamin A in the body. While beta-carotene acts as an antioxidant, once converted to vitamin A it has several additional functions. Vitamin A is critical for immune functioning, vision and normal functioning and maintenance of several organs. 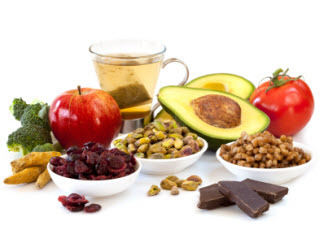 Though the exact role and biological importance of many antioxidants remains unclear, research suggests a diet high in antioxidant-rich foods is associated with good health. In addition, consuming naturally antioxidant-rich fruits and vegetables at each meal may help counteract free radicals produced during digestion and metabolism. There are few safety concerns associated with the consumption of naturally occurring antioxidants from food, however, more isn’t necessarily better, especially in supplement form. If you choose to take a multivitamin to supplement your diet, check the supplement facts on the back of the label and look for RDAs (Recommended Dietary Allowances) at or close to 100%. Most trusted multivitamin brands also contain a healthy dose of antioxidants, including Geritol® multivitamin which contains 100% or greater RDA of antioxidants, including Vitamin A, Vitamin C and Vitamin E.
Medline Plus. NIH. Antioxidants. Retrieved from: http://www.nlm.nih.gov/medlineplus/antioxidants.html January 6, 2013. Birben E, Sahiner UM, Sackesen C, Erzurum S, Kalayci O. Oxidative stress and antioxidant defense. World Allergy Organ J 2012;5(1):9-19. Retrieved from: http://www.ncbi.nlm.nih.gov/pmc/articles/PMC3488923/ January 6, 2013. Antioxidants and Health: an Introduction. NIH National Center for Complementary and Alternative Medicine. NCCAM Pub No. D450. Retrieved from: http://nccam.nih.gov/health/antioxidants/introduction.htm January 6, 2013. Institute of Medicine. Food and Nutrition Board. Dietary Reference Intakes: Vitamin C, Vitamin E, Selenium, and Carotenoids. Washington, DC: National Academy Press, 2000. Retrieved from: http://www.nap.edu/catalog.php?record_id=9810 January 6, 2013. Paiva SA, Russell RM. Beta-carotene and other carotenoids as antioxidants. J Am Coll Nutr 1999;18(5):426-33. Retrieved from: http://www.jacn.org/content/18/5/426.long January 6, 2013. Biesalski HK, Grune T, Tinz J, Zollner I, Blumberg JB. Reexamination of a meta-analysis of the effect of antioxidant supplementation on mortality and health in randomized trials. Nutrients 2010;2:929-49. Age-Related Eye Disease Study Research Group. A Randomized, Placebo-Controlled, Clinical Trial of High-Dose Supplementation With Vitamins C and E, Beta Carotene, and Zinc for Age-Related Macular Degeneration and Vision Loss. AREDS Report No. 8. JAMA 2001;119;1417-1436. Retrieved from: http://archopht.jamanetwork.com/article.aspx?articleid=268224 January 6, 2013.